Brigade Garrison Artillery during the Fenian Raids in 1870. He held a general service medal with one clasp for his excellent service and a long service decoration. The photograph of him is taken in October 1879 by William Topley. In 1885, he was promoted to second lieutenant of the Governor General’s Foot Guards. He commanded the Regiment from 1899 to 1904. He was secretary of the Department of Agriculture from 1896 to 1908 and was then appointed assistant deputy minister of agriculture in 1909. Jarvis retired with the rank of lieutenant colonel and died in Ottawa on March 20, 1927. His grandfather was an officer with General Sir Isaac Brock at the Battle of Queenston Heights. Awarded the Long Service Medal by General Order 9 in 1902. 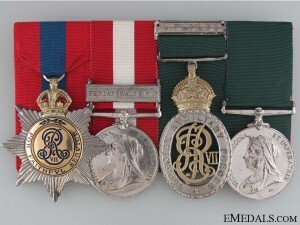 Awarded the Officers’ Decoration by General Order 157 in 1908.